Egypt's President Abdel-Fattah El-Sisi reappointed on Monday the country's prime minister Ibrahim Mahlab to head a caretaker government shortly after he handed in his notice, Al-Ahram's Arabic news website reported. 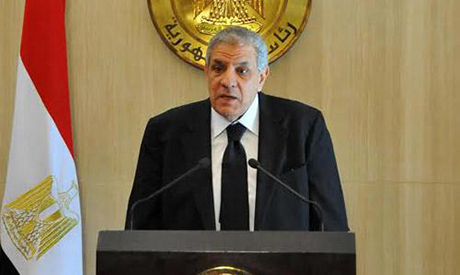 Mahlab had tendered his cabinet's resignation to newly inaugurated President El-Sisi earlier on Monday to choose a new team, but was asked to retain his position in the new government. "I am honoured to, along with the cabinet ministers, present our resignation to clear the way for the choice of whoever is suited to serve the country and press ahead with the milestones of the coming phase," Mahlab said in his resignation letter to El-Sisi, according to MENA. "[We] have expended the utmost effort, under particularly difficult circumstances, to carry out the duties we have been entrusted with," read the letter. Mahlab was appointed last February following the resignation of Hazem El-Beblawi, a liberal economist who was appointed under a transition roadmap following the ouster of Islamist president Mohamed Morsi on the back of massive protests. Since Morsi's removal last year, Egypt has suffered from political turmoil and a battered economy that scared away tourists and investors. Former army chief Abdel-Fattah El-Sisi -- inaugurated on Sunday as Egypt's second democratically elected president -- secured a lopsided presidential victory against his sole rival, leftist politician Hamdeen Sabahi, with nearly 97 percent of the valid ballots. The prime minister said last week he would quit his post – in which he has served less than four months – once Egypt's new president is sworn in. Mahlab is expected to remain in office with a limited cabinet reshuffle and a restructuring of provincial governors, a cabinet official has told Al-Ahram's Arabic news website. He said in comments carried by MENA the current government would remain on in a caretaker role until a new cabinet is formed. The new cabinet will also act as a caretaker government in the absence of parliament that, under Egypt's 2014 constitution, has to endorse a president's choice for a prime minister. Egypt's parliament was dissolved in 2012 by a court ruling that said it was unlawfully elected. New parliamentary elections are due to take place within months. It is not clear when the new full cabinet will be named as Mahlab has said talks on the new line-up have yet to start. Under Egypt's constitution, a parliament majority has to approve a president's choice for prime minister within 30 days of the president's call. In case a chosen premier and his cabinet fail to secure the votes of a majority of MPs, another candidate is fielded by the party or coalition that secures the largest parliamentary bloc. If the second nominated premier and cabinet are not approved by parliament within 30 days, the parliament is deemd dissolved and the presdient calls new elections. Thanks. We lucky to have you. We need to celebrate the Policy, Security and armed forces for protecting our nation during that hard time. Allah Akber.